The Pittsburgh Tribune Review reported last month that asbestos concerns had halted the dismantling following an auction of its all its contents. A state Department of Environmental Protection inspector “ordered the building secured until it could be examined to determine if asbestos is present. As a result, Altman dozens of successful bidders had to wait to collect their purchases. purchased the property for more than $2.5 million after the inn, restaurant and bar closed in January. The real estate developers plan to raze part of the structure to make way for commercial development. The sale included the inn, 14 acres and a house on the property…. 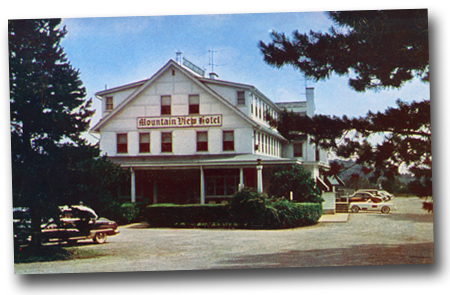 The hotel’s Mountain Laurel wing overlooking Route 30 will be retained as a 53-room lodge run by about 10 employees, according to plans presented this week to township officials. This entry was posted on November 17, 2009 at 9:39 am and is filed under highways, history, Lincoln Highway, lodging, roadside, transportation. You can follow any responses to this entry through the RSS 2.0 feed. You can leave a response, or trackback from your own site. Well I’m sure glad those fellas tore down that charming historic landmark and replaced it with a weed mountain and field of dirt. Yep, real big improvement. Well that’s OK because after making all those improvements it’s for sale now. Thanks guys.